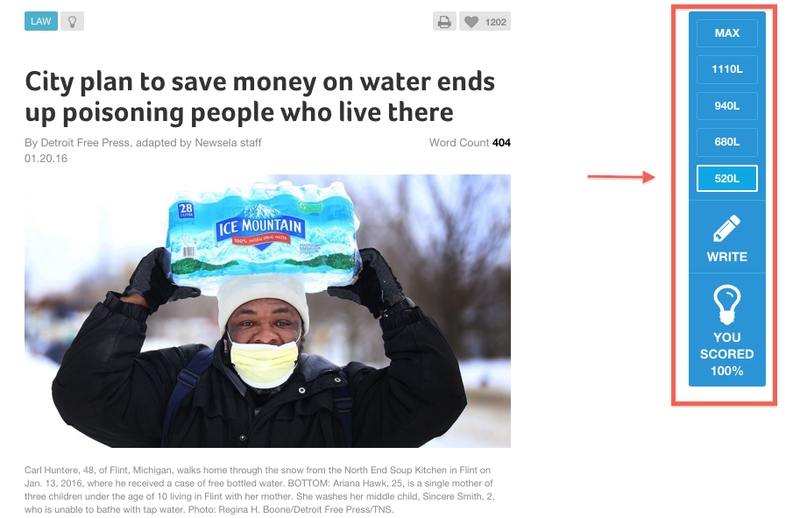 Newsela consistently engages kids with its content. They have a terrific sense of what kids will be interested in and yet they never underestimate kids' ability to think about big issues. They balance fun articles (Jedi lightsaber exercise class) with hard-hitting news (Flint, Michigan water pollution crisis). And they use great photos to draw kids in. It's easy to search for specific topics or browse general interest areas--and this encourages kids to figure out what interests them, to discover the news that matters. I also love that there's a dedicated site for elementary kids, recognizing that some articles are better for younger kids than others. Kids can select the right reading level for them, adjusting the article with an easy click. Nonfiction is harder for many kids to read, especially current events about topics that are new to them. Newsela lets kids read an article at an easier level, with simpler sentences and less complicated vocabulary. They can read, change the level and re-read the same article. Kids with different reading levels can read and discuss the same article but at a level just right for each kid. We all like personalizing our reading experience. Kids sign up for free Newsela accounts--at school, I recommend that they use their school Google account to automatically sign in. Newsela lets readers mark which articles they like and recommends other articles on a similar subject. Teachers love the annotation features. Kids can highlight and annotate articles, saving their thoughts for later. This makes it great for prompting deeper thinking, discussions and further writing about articles. This feature promotes active reading, helping kids focus on main ideas and engage with the material. It's so easy to use that I have found kids enjoy it. While I am not a fan of multiple-choice quizzes, I actually think these quizzes help kids check their understanding of the article. They also let kids practice taking this type of quiz in a low-stress environment. This helps them practice just the sorts of questions that will be on state tests, but helps them keep a growth mindset--noticing how they get better as they practice more. I love the way that Newsela editors are creating text sets to encourage kids to read more broadly. Some recent examples include text sets on animal ethics, bullying, and pollution. Teachers will especially like the PRO/CON text set to support students' persuasive writing. And now, it's even easier to use at home with your mobile device--Newsela has just released its app for iPads and iPhones. See this Newsela blog article for more information. I've only just started testing this, but I like it already. It's easy to check the most recent news, and it's also easy to search for specific topics. I love the way readers can easily change the reading level on the app -- very well designed. 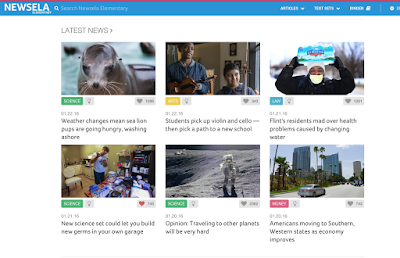 If you're looking for a way to engage kids with the news, definitely check out Newsela. I'd recommend the Newsela Elementary site for grades 3-5, and the regular site for grades 6 and up. I have only used the free site, and I hope that it continues to provide robust access for general free users. We use both the free and PRO site in our school district. My daughter's 6th grade teacher uses the PRO subscription site and really likes the additional data he gathers. For families and many classrooms, the free site is a terrific resource. If you make a purchase using the Amazon links on this site, a small portion goes to Great Kid Books. Thank you for your support. We celebrate Martin Luther King Jr. Day on the 3rd Monday of January by honoring the life and legacy of the man who brought hope and healing to America. Here are some resources you may find helpful in talking about this great man’s life and contributions with young children. 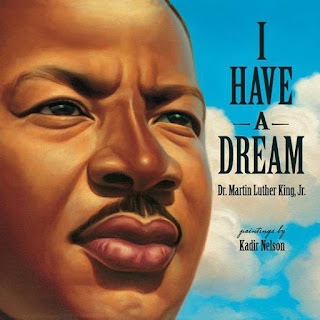 I Have a Dream, by Martin Luther King, Jr. and illustrated by Kadir Nelson. This book is a powerful way to share Dr. King's famous speech at the March on Washington. Kadir Nelson's paintings are not only a moving tribute, they provide a way for children to reflect on the meaning of King's words. A CD is included with a recording of Dr. King's speech. Martin’s Big Words, by Dorreen Rappaport, illustrated by Brian Collier. 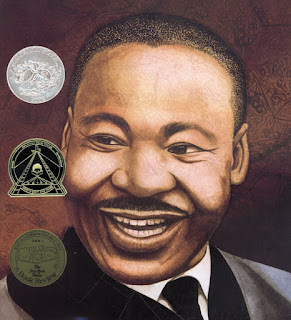 This picture book biography is an excellent way to introduce children to Dr. King's life and work. I love the way Rappaport weaves quotes from Dr. King throughout the story, giving readers a real sense of the power of his words. 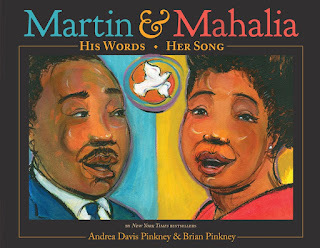 Martin & Mahalia: His Words, Her Song, by Andrea Davis Pinkney, illustrated by Brian Pinkney. When Dr. King gave his famous "I Have a Dream" speech at the March on Washington, he asked gospel singer Mahalia Jackson to sing for the crowd, to lift their spirits, to inspire them with her voice. This picture book tells the story of both Martin and Mahalia, as they each found their passions and their voices. Part picture book biography, part story of a historic moment--this is an evocative picture book. 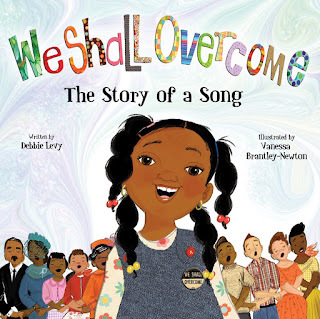 We Shall Overcome: The Story of a Song, by Debbie Levy, illusrated by Vanessa Brantley-Newton. The song "We Shall Overcome" became an anthem of the Civil Rights Movement, but it has gone on to represent the fight for equality and freedom around the world. This picture book tells the history of the song, from its beginnings in America's harsh times of slavery through gospel songs of the early 20th century, to the protest movements of the 1960s. The King Center is both a traditional memorial and an active nonprofit committed to the causes for which Dr. King lived and died. Browse the digital archives; have students reflect on quotes. Time for Kids: One Dream -- 17 people remember the March on Washington. Time for Kids has an excellent mini-site dedicated to honoring Dr. King's work and legacy. I particularly like the One Dream video, with reflections of people including Representative John Lewis, Clarence Jones (speechwriter for Dr. King), Joan Baez and many others. History.com: Martin Luther King, Jr. Leads the March on Washington This is a good, short video that explains the context of the March on Washington and its political message, but please preview because some of the scenes are intense. As our communities struggle with the impact of racism near and far, it is important that we take time in our families and in our classrooms to reflect on Dr. King's message. I am inspired by the work of the artists and authors who share that message through their own work. And I am inspired by the thoughts my students have shared this week as they reflect on their hopes and dreams for a more just, more peaceful, more equitable society. Kids ask for funny books all the time, but the Newbery Committee does not often honor books that kids find as truly funny. 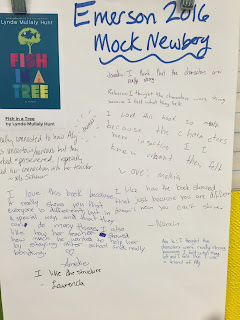 I try to honor that in the books we consider for our Mock Newbery discussions. Many have speculated that this is because humor is so subjective, but I would argue that it is more because kids value humor so much more than adults. Many kids would prefer book with lots of humor and perhaps less weighty themes. A tiny magical creature known as a brownie, Angus Cairns is bound by a family curse to serve the youngest female in the McGonagall line. As the story opens, he must travel from Scotland to America to find Alex Carhart, the great-great-great-niece of his recent mistress. Brownies excel at putting things in order, and this could be a huge help to young Alex--except that she and Angus both have feisty tempers that often get in their way. My students loved the humor in this story. They talked about the magical creatures with delight, saying they were well developed and came alive. I had so much fun listening to the audiobook for this story. Euon Morton especially brought Angus to life, with his terrific Scots accent. I would argue that Coville's use of language is outstanding, especially creating Angus' voice. Just look at how Angus describes Alex: She's a "disorderly, messy, negligent, slapdash, untidy, unfastidious, unsanitary creator of disorder," (as quoted in the PW Review). 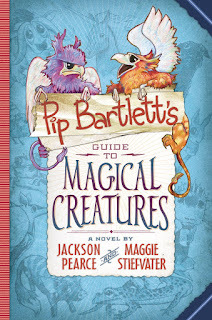 Magical animals also infuse Pip Bartlett's world, and she relishes her special ability to talk with them. She can't wait to spend the summer with her aunt, who's a vet for magical animals. But disaster seems to strike around every corner for Pip, whether it's the unicorns stampeding at a school fair, or Fuzzles catching fire as they hide in people's underwear drawers. Students definitely liked this for the magical creatures, but they also recommended it to friends who like funny books. 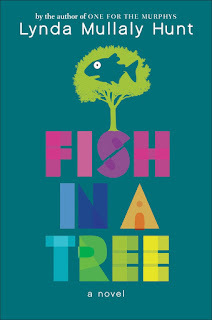 Pearce and Stiefvater create many laughs from both the situations Pip finds herself in, and from the outlandish behavior of some of the animals. As students talked about the story, they started to notice the growth in Pip's character. Both of these books are the beginnings of new series for established authors. My students are definitely looking forward to the next installments, both scheduled to be published in October. The review copies were kindly sent by the publishers, Random House and Scholastic, but we have also purchased additional copies for our school library. If you make a purchase using the Amazon links on this site, a small portion goes to Great Kid Books. Thank you for your support. We read to get to know other characters, but at the same time we read to get to know ourselves. Some of my students really want to get inside and feel what the characters in books are going through. 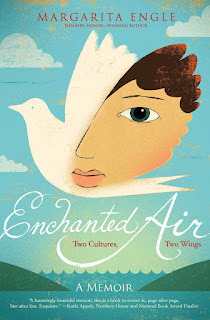 Enchanted Air and Fish in a Tree appealed to readers who like heartfelt, emotional stories. In this memoir in verse, poet and novelist Margarita Engle writes about her childhood growing up in Los Angeles and visiting her grandmother in Cuba. My students talked about how they felt that Engle almost had a twin living a whole life in each country, that she had twin homes--feeling at home both in Cuba and in the United States. Her heart was in both places. Although this is a very touching story, some students felt that it was too slow. The plot didn't hook them, and so I think it was harder for them to connect to the character and her emotions. I wonder if this is a book better appreciated by a slightly older reader, or one that would benefit from more discussion with a group so students can unpack some of the ideas about immigration, identity and home. Aly Nickerson has changed schools nearly every year: seven schools in the past seven years. With each new teacher, she acts out and dodges questions to cover up the fact that she cannot read. Letters and words dance on the page. Aly's confusion and anger touched my students, but it was really her journey that made them recommend this to friends with earnest enthusiasm. 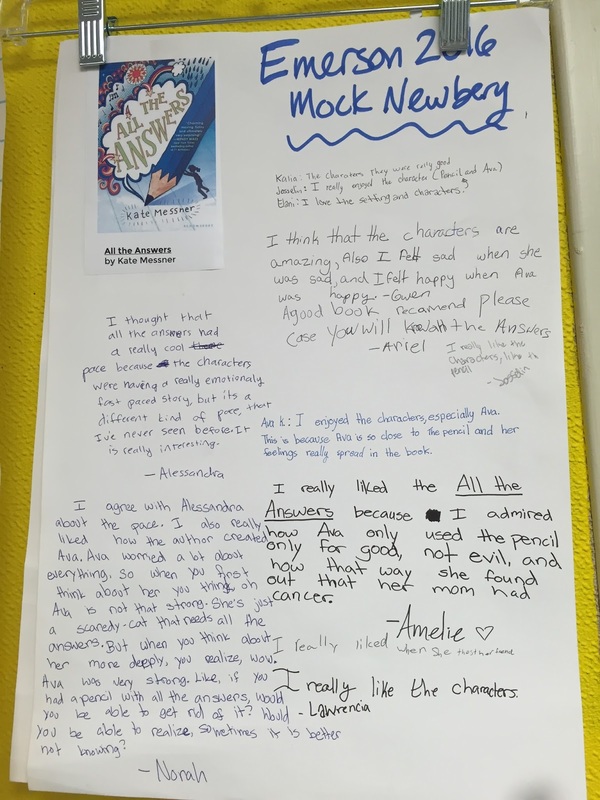 Students talked right away about how Lynda Mullaly Hunt helped them understand the range of Aly's complex emotions, feeling empathy but never pity. Aly's friends were all interesting, distinct characters. While adults might wonder why Aly's previous teachers never noticed her dyslexia, my students just loved her relationship with Mr. Daniels. This is a book that will continue to touch students for years to come. The review copies were kindly sent by the publishers, Simon & Schuster and Penguin, but we have also purchased additional copies for our school library. If you make a purchase using the Amazon links on this site, a small portion goes to Great Kid Books. Thank you for your support. Kids who are excited by a book love telling their friends about it. And the honest truth is that they listen to their friends much more than they listen to adults. But often kids start rambling too much as they summarize the story. Our Mock Newbery discussions have helped kids focus on what really makes a story good--what aspect of the story grabbed them. 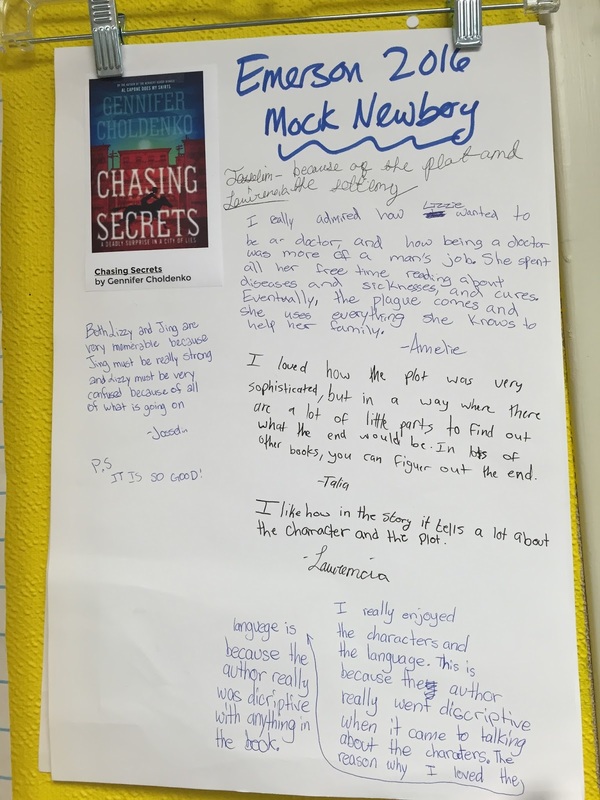 Today's books have definitely created "book buzz" at Emerson: Bayou Magic and Chasing Secrets. 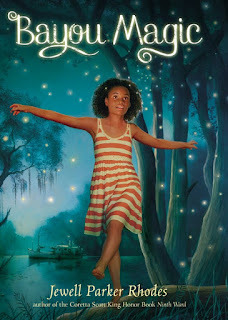 This summer is Maddy's turn to visit her grandmother; each summer, Grandmére sends for one of her grandchildren, asking that they spend the summer with her in the Louisiana bayou. Maddy's older sisters warn her that Grandmére is strange, a witch, and very strict, but Maddy develops a special relationship with her and realizes that she feels at home in the bayou. In fact, Maddy senses that she has a special power to feel things, to hear things like her grandmother does. Students loved the way Jewell Parker Rhodes describes the setting--it brought them right into feeling like they were in the bayou. But I think it's more than that; Rhodes helps them see the bayou through Maddy's eyes. She's a newcomer, but one with an innate sense of the magic in the bayou. Several commented about how many sensory details they noticed in the book. You knew how Grandmére smelled, how the hot air felt on your skin, how the light sparkled through the trees. Maddy becomes good friends with Bear, a young boy who lives near her grandmother. Rhodes skillfully develops the plot, as Bear helps Maddy search for the elusive mermaid she is sure she's seen, sticking by her when all logic would say she's imagining it. And this friendship helps her believe in herself and trust her intuition, her sense of family magic as an environmental disaster is about to strike. Choldenko weaves a plot with plenty of action and suspense, full of historical details but never weighed down with too many details. San Francisco in 1900 was a growing city full of wealth from railroads and the Gold Rush, but it was also a city marred by discrimination against the Chinese American community. In the midst of this, the city leaders try to cover up an outbreak of the plague, and then try to show they are handling it by quarantining Chinatown. Lizzie can't stand all the expectations for her to act like a lady, prim and proper, when she really wants to become a doctor just like her father. Right away readers get a sense of just how different medical care was at the turn of the 20th century when Lizzie accompanies her father on a house call. The plot is full of twists and turns, as Lizzie overhears her uncle's newspapermen colleagues talking about the plague. When Jing, the cook for Lizzie's family, fails to return home, she sets out to help him. 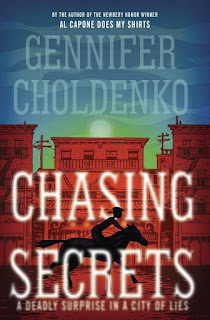 Choldenko's steady pacing kept students interested in the mystery, as the story built to an exciting climax. 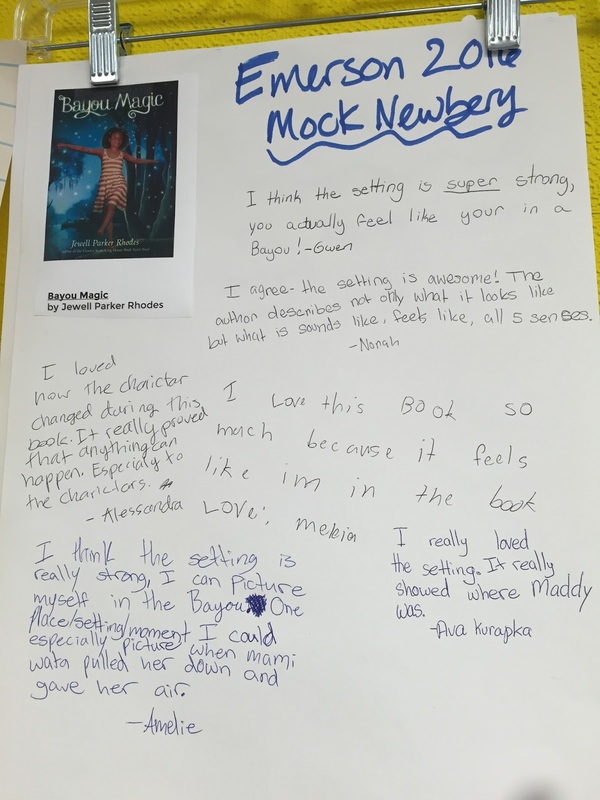 Both of these books create a specific setting and characters, so students could create a movie in their mind and imagine being right there alongside the main character. It's interesting that both of these stories are told from the first person perspective, and this helps many young readers step into the shoes of the main character. It will be interesting to see what kids think about the secondary characters in these stories, whether they feel fully developed as individual, distinct people. The review copies were kindly sent by the publishers, Little, Brown and Random House, but we have also purchased additional copies for our school library. If you make a purchase using the Amazon links on this site, a small portion goes to Great Kid Books. Thank you for your support. 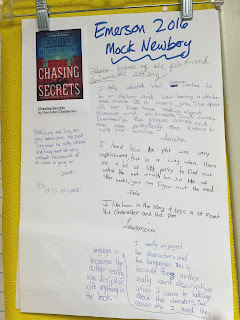 Our 4th and 5th grade Mock Newbery Book Club meets on Thursday for final discussions & voting. This week, I'll share my students' thoughts on each nominated titles (see this post for our full list). Special thanks goes to Armin Arethna, our fantastic Berkeley Public Library colleague who is a vital part of our book club--what a terrific school-public library collaboration and friendship! As we discuss books, we start out by sharing what we like about them. We only have two or three copies of each title, so kids are reading different books all the time. We have lunch together and share about what we've been reading. If someone raves about a book, their friends start clamoring to check it out next. This "book buzz" is the best thing ever! Students talk about these different aspects of a book in their classes, so they are able to apply them here when we start comparing books. Just like with the right committee, they end up with a few favorites and then have a terrible time deciding on which one to vote for! 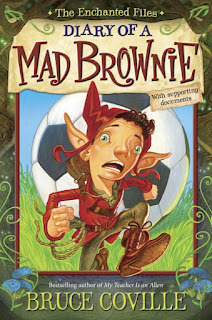 My students *loved* this novel: a realistic friendship story touched with just a bit of magic. Ava is a worrier; whether it's homework or a test or her family, she gets anxious. Math tests are the worst. 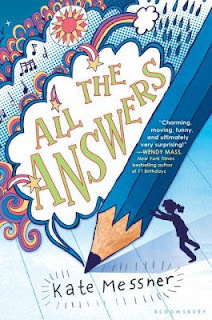 One day when Ava finds a pencil at the back of her junk drawer, she starts doing her math homework just like normal--but it turns into anything but normal when the pencil starts talking to her, telling the answers to any question she writes down. This book spread through our 4th and 5th graders, getting passed from one friend to the next. Our two copies were checked out over 30 times in just 3 months! In the poster below, you can see how many kids wanted to share their thoughts. Right away students talked about how much they would like a pencil that told them the answers to test questions. But soon, they started reflecting on the characters, plot and themes. As Kalia wrote, "The characters were really good." Josselin added right away how she enjoyed the characters (the Pencil and Ava). As we started talking more, students noticed how much Ava changed during the course of the novel, growing stronger and more self-assured. They realized how much they related to Ava, her worries and her dilemmas. Talking about these books, digging into them together really deepens all of our appreciation for the author's craft. Just look at what Norah wrote on our poster -- and remember that this is after she's been talking about it with her friends and classmates for two months. 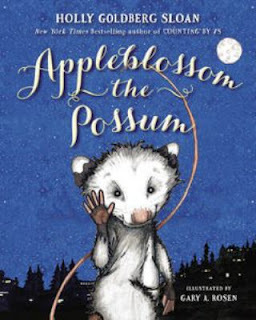 In contrast, while students reported liking Appleblossom the Possom, it wasn't a book that kids shared much about. 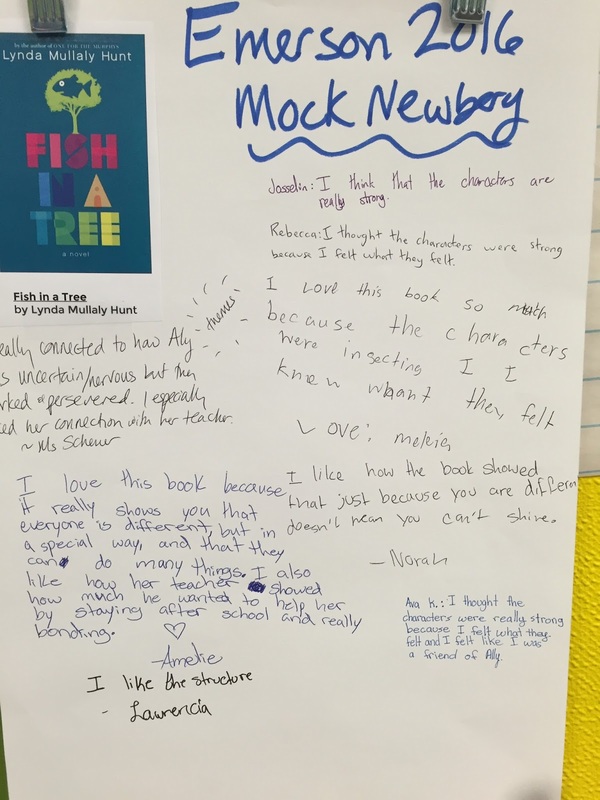 Two students liked it enough to nominate it, but it never created that "book buzz". Like for all young possums, there comes a day when Appleblossom has to venture out on her own and find her way in the world. In many ways, exploring the world is exciting for a curious youngster--but it quickly turned frightening for Appleblossom when she fell down a chimney and was trapped inside a human family's house. Holly Goldberg Sloan creates an immediacy in the nighttime setting as seen from a possum's perspective, and she adds a humorous element by emphasizing the dramatic tendencies of possums as they learn how to "play dead". The story is full of adventure as Appleblossom's brothers work to rescue their sister. I'm not quite sure why students didn't talk about this as much. Perhaps they found the dramatic asides to be overbearing, or perhaps Appleblossom didn't change enough to be satisfying for them. But it could also be that kids who like animal fantasies didn't come to our book club because they didn't find other animal fantasies to read. I was fascinated by the contrast between this book and Holly Goldberg Sloan's previous novel, Counting by 7s, which my students really responded to and nominated for our 2014 Mock Newbery. Review copies were sent by the publishers, Bloomsbury and Penguin, and copies were also purchased for our school library. If you make a purchase using the Amazon links on this site, a small portion goes to Great Kid Books. Thank you for your support. It's no secret that my students love graphic novels, but many parents and teachers are still reluctant to see these as stories worth reading. Yet I would argue that Roller Girl presents a compelling story with interesting, well-developed characters who struggle with friendship issues -- and does so better than many of the more traditional novels I've read this year. Astrid and her best friend Nicole have been best friends since 1st grade, but things begin to change as they head toward middle school. When Astrid's mom takes them to see a roller derby match, Astrid thinks it's the coolest thing ever--the players looked really tough, with weird hair, crazy names and creepy makeup. When she sees a flyer announcing a summer camp, Astrid knows she just has to go -- she is totally determined to become a roller girl. Life isn't so neat and simple. Even though they've always done everything together, Nicole decides to go to ballet camp instead of roller derby camp. Astrid doesn't let this sway her, and heads off to roller derby camp on her own. The summer is full of ups and downs, twists and turns as Astrid navigates friendship issues and learns how to play roller derby. Jamieson creates characters who are likable but flawed in a way that rang true with me. Astrid is strong and determined, but she jumps to conclusions at times -- and ends up coming close to ruining friendships as a result. When she grows apart from Nicole, she assumes that mean-girl Rachel is going to take her place. I especially liked the way that Jamieson shows the complexities of friendship and avoids a sugar-sweet ending. Learning how to play roller derby takes grit and determination. Astrid falls down time and time again. But she's inspired by her hero Rainbow Bite, who encourages her to practice and practice if she wants to get playing time. Throughout, Jamieson weaves themes of determination, honesty and friendship without overpowering the plot or making it feel didactic. 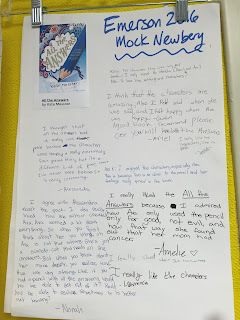 Today we discussed Roller Girl and 8 other books in the Heavy Medal Mock Newbery discussion. 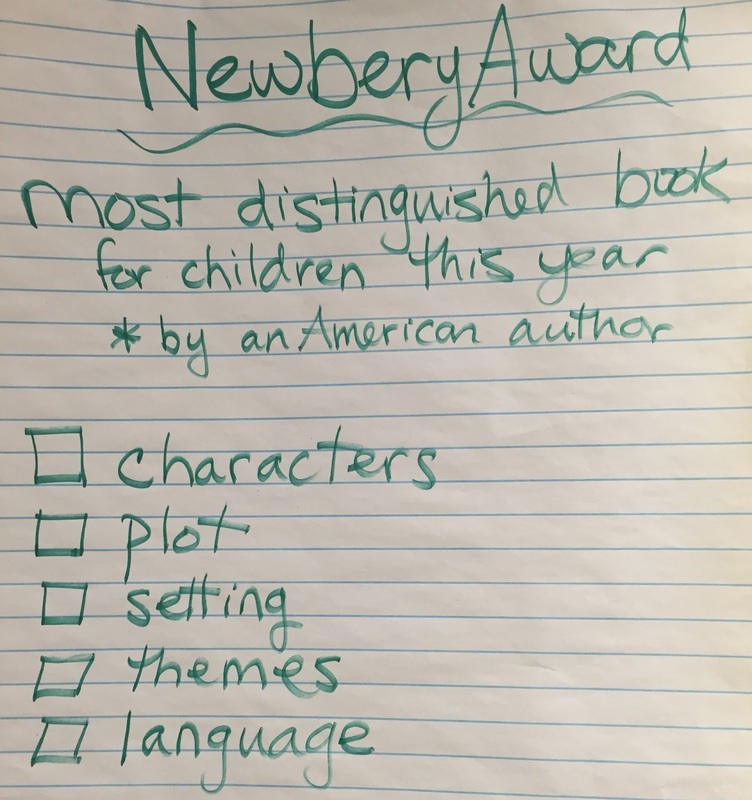 The rules for the Newbery Award instruct committee members to focus on the words and not the pictures--and so for many years I had considered graphic novels difficult to consider in the same way as other books. But today I had the realization that I want to look at the whole book that the author has created. 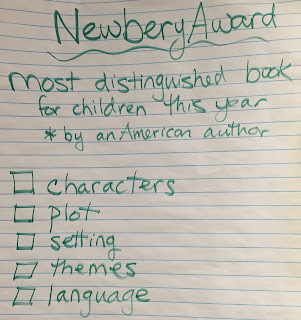 The Newbery rules (see the Newbery terms and criteria online) instruct committee members to consider the following criteria: theme, information, plot, characters, setting and style. And so I want to start encouraging my students to think about graphic novels in terms of these criteria as well. 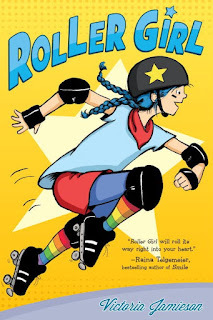 In my view, Roller Girl is distinguished in the way it presents themes for children as they transition from childhood to adolescence. 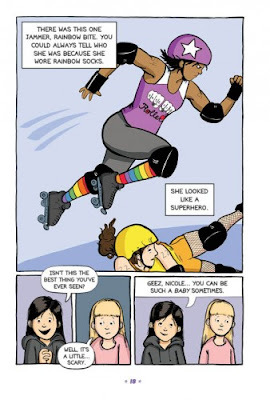 The roller derby setting is exciting, thoroughly developed and compelling. The characters are fully developed in nuanced, authentic ways. I want to focus on the overall story, as I read and talk about books with children, instead of just trying to focus on the words. As I reflect on this story, I am reminded of the power of talking about books. We grow through our chance to share and reflect together. I entered today's discussion liking Roller Girl, but unsure how to compare it to other books. Today's discussion helps me see why my students return again and again to books like Raina Telgemeier's Smile and Kazu Kibuishi's Amulet series. It isn't just their visual appeal, it's their overall literary appeal as stories that speak to children in powerful ways.